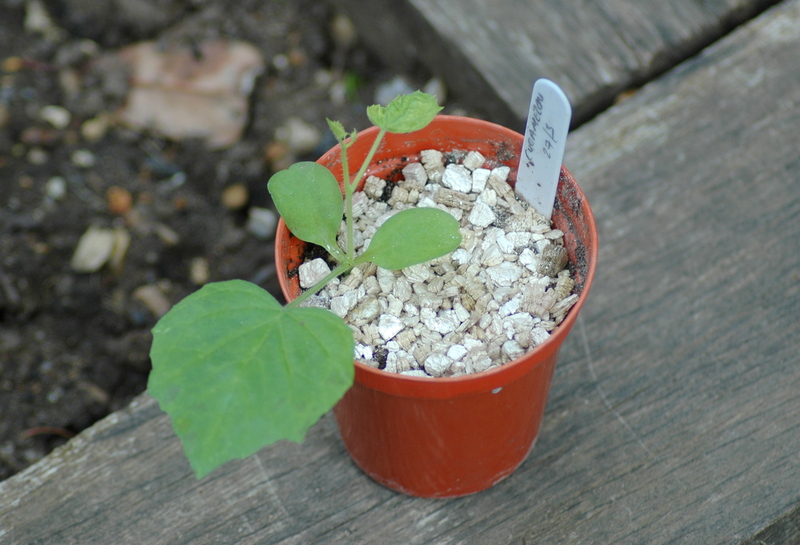 Growing Cucamelon from seed. This is a first for me. I have planted one seed per pot around half an inch deep and put them in the propagator at 20°C. 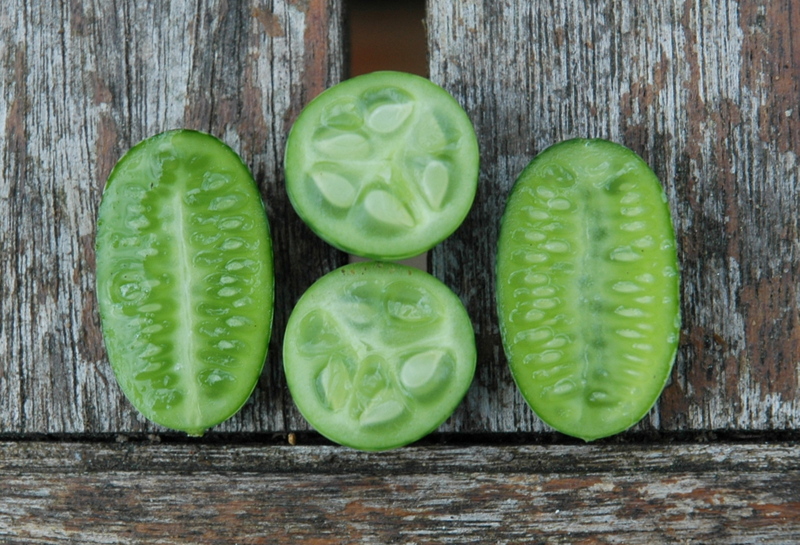 The Cucamelon fruit is the size of a grape, looks like a melon and tastes like cucumber with a hint of lime. It’s now been over 6 weeks since sowing the Cucamelon seed. They certainly did take a long time to germinate. It must have been a good 3 to 4 weeks before a tiny green shoot appeared, however, they are now making steady progress. I have kept them in the propagator in the greenhouse all this time. Still set on 20°C, but leaving the lid off during the day. Considering most of the cucumber varieties that were sown at the same time, are now 9″ tall, Cucamelons are definitely slow starters. I potted on the cucamelon into a large terracotta pot about 3 weeks ago. It’s now sat in the corner of my greenhouse and the vine is now about 6 foot tall and seems healthy. We have about half a dozen flowers and as you can see from the photo above, small fruits are starting to form. I am watering as I do my tomato plants that are growing alongside it and feed every other day with tomato feed. The small cucamelons have just started to swell. They have doubled their size in the last week. I’m hoping one or two may be ready to try next week. Today I picked my first Cucamelon crop. It may only be a small crop, but there are plenty more on the vine, swelling nicely. The taste is really fantastic. You first get a little hit of citrus, then followed up by a wonderful cucumber flavour. I can imagine they would be lovely in a gin and tonic! The crop just keep on coming. There seems to be no end to the amount of fruit we can pick from our cucamelon vine. As soon as we pick a handful, it seems to be replenished overnight. Hi Britta. I say definitely give them a go. I’m sure they will work in a container. I have updated the post above. All the best. 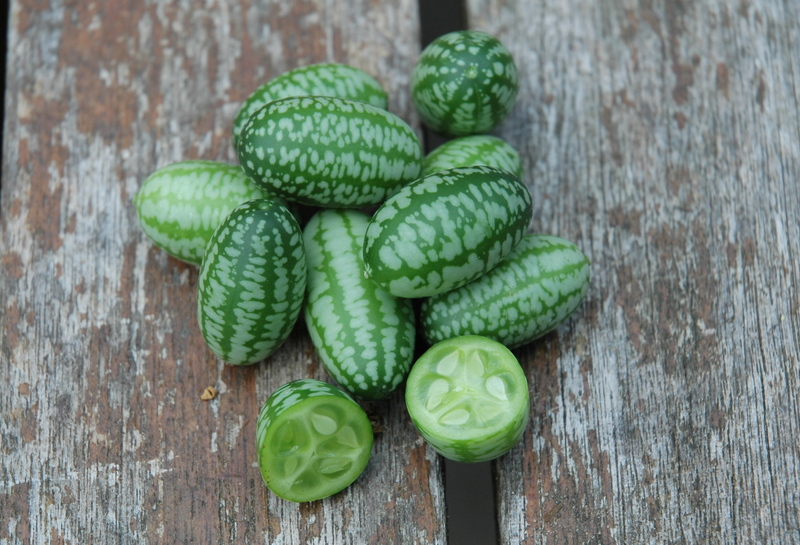 I’d would like to grow some Cucamelon plants. Can anybody provide me with a few seeds? I’ll be grateful. 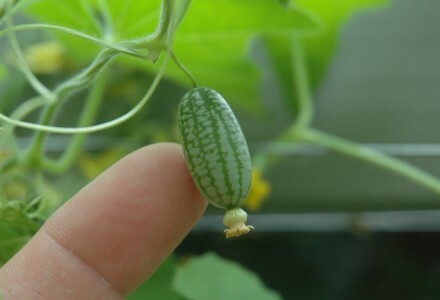 I can exchange them with seeds of Southern Italian Melon-Cucumbers. how are these coming along? I’ve had mine planted in pots on my windowsill for a week and there is only 1 very tiny shoot just starting to come through. Hoping they have a sudden growth spurt soon so i can get them in a grow bag! Hi Dave. I have updated the post above. Slow but steady! about 6 weeks and they’re about 1cm tall, see what you mean about slow and steady! I don’t know if this is just my batch of seeds but i have a very low percentage of the seeds germinating! I have just updated the post to include a picture of the small cucamelon fruits that are forming. Hi there! So I live in Las Vegas Nevada, and my cucamelons have taken OFF!!! they are growing out of control!! And I see a bunch of little flowers and buds starting to form, however after a few days the little cuca buds turn black and die. They have direct sunlight only in the morning when the temps are cooler(for Vegas this time a year) and during high heat they are shaded. I water twice a day, sometimes 3 times given the heat. Am I doing something wrong, or are there bugs or a fungus killing them?? I am so disappointed, I was looking forward to my little melons!! Please help!!! Hi Brittney. It’s great to hear your Cucamelons have taken off, but sorry to hear you are not getting any fruit. To be honest, this is the first time I have tried to grow Cucamelon. Mine is only about 18 inch tall so far, but then I’m here in the UK and I’m guessing Vegas is a little warmer 🙂 Is there plenty of air circulating around the vine. Although unlikely, I wonder if you are over watering or if there is too much humidity? No humidity what so ever!! Lol it’s a pretty dry heat.. And they are fully exposed out side.. Hmm hopefully they will grow 🙁 Vegas might just be too warm.. (Today it was 112 degrees) good luck with your plants!! Hi Brittney. I have just updated the post with a photo of the small cucamelon fruits that are forming. How are yours coming along? Try watering them during the evening/nighttime. Some plants can scorch when watered in high temps. mine are on a window in direct sunlight all day so they are watered at dawn and dust. try covering the soil surface with shredded coconut shell. This will reduce heat effect on roots and reduces water loss through evaporation. Hi. My cucas grew quickly and produced the flowers and fruit like in your photo. Are your fruits swelling at all. Mine seem to look the same after 10 to 14 days. Meanwhile the plants are branching out everywhere! Hi Steve. Loads of flowers and fruits, but none swelling. All look like mini gherkin shape. Like you, the vine is going everywhere. I’m growing these in northern California at 3000 ft elevation outside in the open. I germinated them May 25 and today have the first flowers opening up . The vines are really taking off and like climbing the deer fence. A fun adventure and we are excited to taste them . 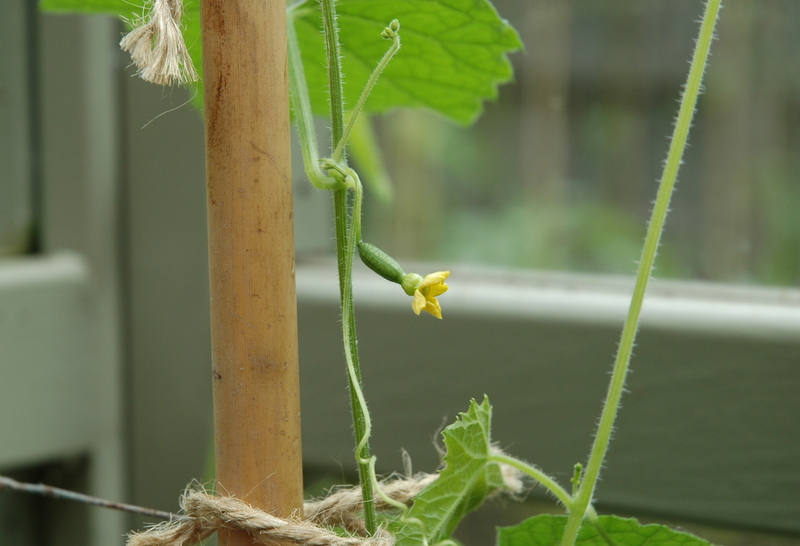 Whilst I’m only in, usually chilly, England, we have been basking in over 30 degrees for the last week or so and the cucamelon vine is now stretching out across the roof of the greenhouse. How long from the Buds until the fruit is ripe ? I’d like to use a green house here but we can have snow at times that would destroy it . I’m thinking of growing the Cucamellon in my aero garden along with tomatoes in the fall. I don’t know yet as none of mine have swollen much, let alone ripened. My fruits started forming weeks ago, but are still quite thin. I have never tried an aero garden. Sounds like fun for the winter months. Some of my early little fruits have fallen off. I wondered if the flowers need to be pollinated? I lost one or two early fruits too. My cucamelon are in a greenhouse which I leave the door open during the day. They are being pollunated fine, although I do benefit from a neighbour who has several bee hives. hope you obtain some honey! all my baby fruit is falling off. My plant is super healthy and has a lot of baby fruit but none of it has fully ripened. Very dissapointing. Thoughts? The weather has been stellar so that is not the issue. Hi Michelle. I have heard reports of this happening to a few others. My first few fruits fell off, but only a few. I guess the things to check would be consistent watering, good ventilation, not too humid. Have you tried feeding with tomato feed? Looking good on your pics! Still waiting and watching here. I am now picking about a dozen cucamelon a day. I’ve been getting all my friends and family to give they a try. Mixed reactions, from “just tastes of cucumber” to “Wow it’s really citrusy”, but overall, well received and liked. I have just cropped mine and have about a kilo. I am not actually keen on the taste so looking to make a chutney or picallili out of them and will not grow them again. Prefer either a cucumber or a melon somehow. Hi Jane. I’m interested to know if you made any cucamelon chutney in the end and if so, how it turned out? I´m from Portugal, I am thinking in starting a crop of cucamelons, can you tell me the price per kilo in England? Here in Portugal we don´t have cucamelons! Thanks. Hi Filipa. I don’t know a price per kilo. I just buy packs of James Wong cucamelon seeds which you can buy online. After reading the comments above, I planted my seeds March 13 so that they might have a chance of being planted out late May. By March 18, 4/5 seeds had germinated. Now (Apr. 6) all 5 plants are at the 4-5 leaf stage. I may have to reseed later if they get too big. Hi Cathy. It sounds like you are going to have a bumper cucamelon crop this year. Where are you growing them? I planted my seeds about 2 weeks ago but so far no sign of germination.Do they need a heated propagator to get them going or am I just being impatient? Hi Jill. 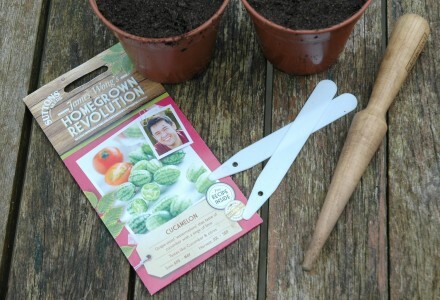 I do use a heated propagator set to about 20 degrees but they still take around 4 weeks to germinate. 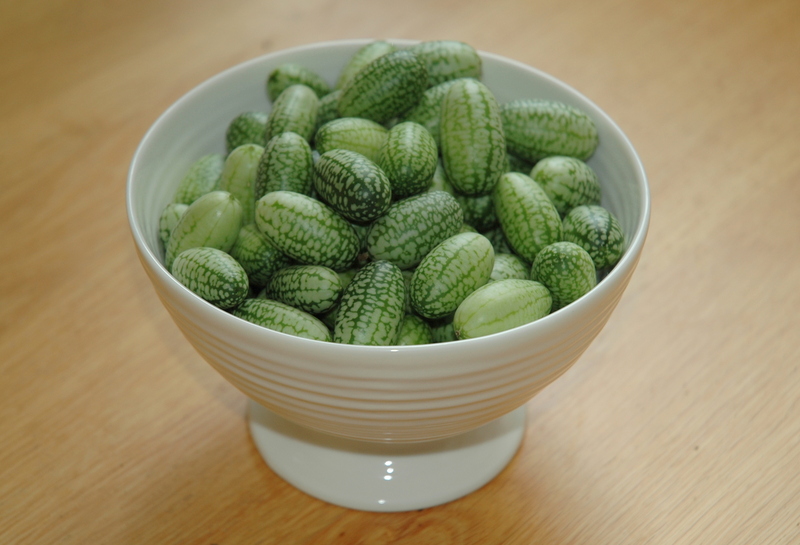 James Wong says you can grow cucamelons outside has anyone tried this in Britian? I have only grown them in the greenhouse, but don’t see any reason for not growing outside once all the frosts have gone. can I replant the cucamelon to buckets? do I need to make a hole at the bottom? I don’t see why not, but yes, I would ensure good drainage. Perhaps a few holes and some crocks or something at the bottom. I have ten plants out in my garden in Gloustershire UK They all are in flower and have very small fruits. Plenty of liquid manure seems to work. Got given two cucamelon plants back in the spring. Both have grown one bushy, the other like a grape vine which is producing small fruits, a lot of hassle for little return. Hi my plants have starting growing and even climbing but no flowers anywhere. Is there something wrong with my plants? Hi. How high are the plants now? We often find that they need to reach 1 or 2 foot tall before flowering, but once they start, they don’t stop! here in the UK i have grown these outside, i have loads of fruit but only one that has part swelled. I have nipped out the ends to encouraged more fruit and nipped off some of the leaves. i am now trying with extra tomato feed to see if this will help them swell. Hi Ryan. The best way seems to be to store the tubar in just slightly moist compost or soil in a cool frost free area. Good luck. I have had this happen too in the past. I believe its changes in temerature which these early fine stems and leaves struggle to deal with. Anybody growing them this year?! I bought some small plants from a garden centre a couple of days ago and potted them up today. Hopefully I didn’t disturb them too much when separating, there were 5 in the same pot all entwined, took me ages to untangle them and lost a few leaves in the process. Growing in a small temporary growhouse in Bucks, UK. Hi. How did they do? Have you been eating any fruits yet? Hi Tracey. I have heard of others growing them outside with some success. I suspect it may depend upon weather conditions where you are. I usually grow in a greenhouse and they certainly do well in there. I have just had a taste of my first cucumelon and I am not impressed, tastes more of cucumber not melon. rather disappointed actually. I grew them in pots in the green house and they went wild so I then planted one in a large pot and the other in the ground in sheltered place close to the greenhouse. They have not taken any harm and are thriving and there is a lot of fruit on the plants .I am unsure what size they will grow to before they are ready to pick. Hi Pamela. I always think they taste like cucumber with a hint of citrus. We usually pick when they are roughly grape sized. I have to say that the fruits appeared quite early on the young plants which was interesting and I have been watching them grow with some amazement. I am not sure I like the taste though. They are an unusual taste, quite cucumber like, but with a hint citrus. Lovely in a Gin and Tonic! This was my first attempt at cucamelons and I’ve found them really easy so far. I now have loads of fruit. Just wondering how I know when to pick them? I would suggest picking them when they are a reasonable grape size. Hi, my cucas are growing great and I have had a pretty good (+delicious) fruit so far. This is my first time growing them, I had never heard of them before now! I would like to know how big they should be when I pick them so they get to their full size, the size of a grape is a little vague. I would say the size of a medium sized grape, perhaps 10mm – 20mm tall. They aren’t quite as nice if they get too big, but perhaps try a variety of sizes and see which you prefer. Thanks, that’s really helpful. I find that they come in so many different sizes, I have one plant that makes really long ones and another that has round ones. Thank you so much for trying. Hi. 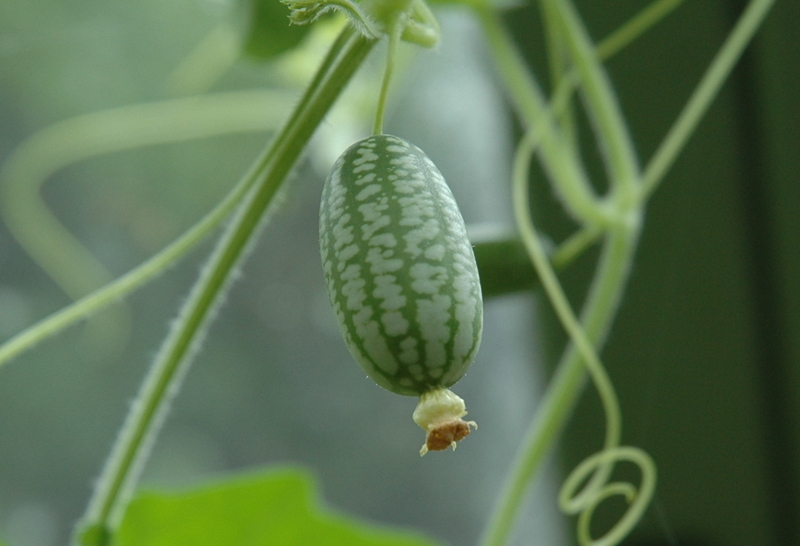 Yes you can grow Cucamelon in a large pot in a conservatory and they’ll be absolutely fine. They’ll need some support as they grow, but otherwise yes, you can grow them pretty much as a tomato plant. Hi I got my first Cucarmelon Plant in April I kept in under cover for the first month in my little plastic greenhouse opening it up during the day Gradually bringing it out into a sunny spot on the table on my south facing patio where it has been now permanently for almost 3 months It has flourished! It’s absolutely heaving with fruits and it’s in a terracotta pot .It was as many of you say a slow starter but it just suddenly took off and looks amazing .I fed it once a week to start with now twice a week and water it well every evening. I live in Cornwall right on the sea (south Coast) and the climate seems to suit it very well.Great little Plant and pretty too! My plants did well in june/july, with fruit. Now in sept. the leaves are brown & dry and no fruit. Is the fruit season over? I live in so calif. It has been very hot, but now getting a little cooler. Am considering cutting back. Any ideas? I’m in the UK and our Cucamelon plants usually die in Autumn. I’m not sure if you can keep them going in warmer climates. It would be interesting to know.